PAGE UPDATED: Tuesday 09th December 2003. Report on each day's play. MATCH REPORTS "DAILY" from GALLE !! BOOK MARK this page. It's YOUR PAGE for the latest TEST MATCH News! A SPECIAL REQUEST FROM YOU !!!! As you probably are aware I am now working confined to a Wheelchair as a Paraplegic after a tragic accident (Click here). I live in Sri Lanka, a country that offers no assistance nor has even the essential basic facilities for Wheelchair users. 99% of all buildings remain no more accessible to at least good ~ 15% of the population here. With all-round quality always in my mind, to serve you in keeping with 'my Objectives', (CLICK here to know them) under these circumstances I have to put enormous amount of added effort under trying conditions and at times also battling the sudden communication breakdowns due to service-provider shortcomings. It is ESSENTIAL to know from YOU, please, if my endeavours ON THIS SPECIAL PAGE, in providing DAILY reports of each days play and match Scorecards, have been of any significant value to you. Kindly spare THREE MINUTES to E mail me direct (CLICK here) giving your valued feedback, with the SUBJECT FEEDBACK, for these TWO QUESTIONS. Was the information updated daily and provided "on this page", worthwhile to you? (A) - Yes, very much. (B). Somewhat (C) Not really. During the First Test Match just concluded, since Day One, how often have you visited this page, please ? (a). Daily on all FIVE days (b) 3 days (c) On 2 days. Thanking you in advance, anticipating your very kind help. "So.. very close, but yet so far"! That was how the first Test Match against England ended for Sri Lanka. This phrase also reminds me how my own career both on and off the field tragically ended for me almost on the eve of umpiring my first Test Match in Colombo. Cricket after all, like life, in every aspect and at every moment of time, is so full of the inextricable unexpected, just like the behaviour of the known Galle pitch on that day-five, contradictory to all believes. England hung on bravely on a dramatic final evening in Galle to draw the first Test against Sri Lanka. Set an improbable 323 to win, they had just one wicket in hand on 210 / 9 when bad light came to their rescue four overs early. Yes, one take pride in a winning performance, but you can also take pride in showing battling qualities and scrapping your way out of a losing position, as England did through magnificent team effort on the final day at Galle, occupying the crease for 376 minutes and defying Sri Lankan bowlers for 108 overs. Few things here Sri Lanka could learn on how to save a test match especially when things are not going your way. Ashley Giles defended like a lion for 101 minutes to be 17 not out off 111 balls, keeping Sri Lankan bowlers at bay. Before that, Mark Butcher (54, 166 minutes, 132 balls), Paul Collingwood (36, 174 minutes, 153 balls) and Gareth Batty (26, 81 minutes, 70 balls) were the key figures in a memorable display of determined and disciplined batting with a will to save the side. Even Muttiah Muralitharan who bagged his twelfth 10 or more wicket haul in a Test Match (with match figures of 11 for 93), could not find a way past either of No. (11) Matthew Hoggard or Ashley Giles. Mark Butcher the rugged left-hand batsman who made the first hundred for England on this tour here, played two charmed though resolute knocks, making twin half centuries for England, (51 in 207 balls at first and then 54 in 132 balls) to become their highest run scorer in both innings. Sri Lanka at first frittered away their chances of building a big total after winning an important toss and having put on a good 76 run opening stand, as their reputed batsmen failed to build a match winning total. With a team packed with five spinners, they then failed to restrict England to a total below 200 on a pitch conducive to spin. The hosts blew their final chance of capitalizing on a sound second innings start of 72 / 1 backed by a 96 run healthy lead when a disastrous run-out triggered off a mini-collapse as Sri Lanka lost 4 wickets for 13 runs in 12 overs. At the end Sri Lanka were certainly the only team that could have won, but curiously, they never showed any urgency to accelerate the scoring at any time to make this happen until they were bowled out. Mahela Jayawardena for his unbeaten 86, although a fabulous innings, took over five hours as Sri Lanka managed to inch their way to only 226 all out at tea after 408 minutes of batting. I personally feel, this considerably reduced the amount of time Sri Lanka should have exposed England batsmen to Willy Murali on day-four evening itself and in the end with weather always threatening, it became a crucial error Sri Lanka have made. A successful 10th-wicket partnership is always entertainment for spectators and also for the batting side. For the fielding side, however, it is always a period of total agony and torture. England twice suffered this fate again at Galle at the hands of Sri Lanka's final pair. The heroic number 11 on both occasions has been the man who had already tormented England quite enough with the ball, Muttiah Muralitharan. In both innings, Murali had to come to the teams rescue not only with the ball but with the bat as well, contributing 38 runs out of 40 in the first innings and then with a personal score of 13 helping Jayawardena to add 46 runs in the second innings, in two last wicket partnerships. If England had managed to dismiss him for less than 5 runs each time, they would only have been chasing less than 250 to win ! Going on past facts, assumptions were made for us to think of a disintegrating and dusty Galle track on which England will have to bat on fourth innings of this Test Match and as such it would be a daunting task for them to defend for so long. However, this expectation remained this time only a dream, to see a different happening there on day-five. The absence of bright and hot sunshine for longer durations along with huge amount of water around from rain especially on day-four night, although the ground staff had done a fantastic thankless job of work to make the ground playable with just a 30 minute delay, perhaps made the pitch to behave differently. Although as reported it was slower, stroke making and batting on it, as expected, was not a nightmare. In fact the bowlers were made to work hard to achieve what they got at the end. Having made use of home advantage and preparing a pitch much favouring the spinners, looking at overall figures below I now wonder if Sri Lanka has been a victim of its own seeking? A case of biter bit. Tillakaratne must have been thinking if he only could bring Muralitharan to bowl at both ends! England were confronted at one end with Muralis magic spin, but apart from Vaas at times, had a comfortable breather from the other end. This has again (and again) been the crucial difference between Sri Lanka and the other side(s). On this spinners track, England had the provisions to apply pressure from both ends with Giles and Batty while Sri Lanka, and for so... long, has been dependant on one spinner to deliver from one end. The story below in figures, is self-explanatory. 2nd INNINGS OF ENGLAND: 210 / 9 / 376 min. / 108 Ov. 2nd INNINGS OF SRI LANKA: 226 / 10 / 408 min. / 97.2 Ov. 1st INNINGS OF ENGLAND: 235 / 10 / 360 min. / 100.4 Ov. 1st INNINGS OF SRI LANKA: 331 /10 / 525 min. / 127.5 Ov. DAY - FIVE AT GALLE. ENGLAND (2nd) 210 / 09 / 108.0 Ov. / 376 min. SRI LANKA (2nd) 226 / 10 / 97.2 Ov. / 408 min. ENGLAND (1st) 235 / 10 / 100.4 Ov. / 360 min. SRI LANKA (1st) 331 / 10 / 127.5 Ov. / 525 min. Sri Lanka came within a whisker of claiming victory! England started the day requiring defending a minimum of 105 overs (which ultimately worked out to be 112 overs) with all ten wickets in hand and at the end rescued by bad light ahead of 4 more overs, walked away relieved with a most tensed draw, the last pair clinging on. The bowling duo of Ashley Giles and Garath Batty were the actual heroes, not with the ball but with the bat, battling for 16.2 overs (whilst adding 34 runs) to save England. In fact Giles continued his battle for further 15.4 overs at first with Johnson and then finally with Hoggard over a total period of 101 minutes and facing 111 balls. Before that brave fighting efforts of Paul Collingwood (174 minutes, 153 balls) and Mark Butcher (166 minutes, 132 balls) in occupying the crease for the longest durations of play, paved the way for stubbornness in batting from Ashley Giles. England will feel like champions with their display of commitment to the cause, especially facing a bowler like Muralitharan on a wearing fourth innings pitch favouring the spin bowling. On the other hand, as I said yesterday, Sri Lanka would be regretting of their ruinous batting that took 52.5 overs on day-four to add just 127 runs. Dinusha Fernando with an immaculate full-length outswinger made Michael Vaughan prop forward for Tillakaratne at first slip to grab the edge as early as the third over of the day, it seemed highly unlikely that England could survive. By then the Sri Lankan bowlers already had almost all day in which get nine more batsmen out in helpful conditions, but just failed to do so at then end. Trescothic came down the track to Jayasuriya, missed contact and was bowled through the gate. Thorpe was made to err by Murali with his shot selection and top edged it to mid-on region when the left hander was completely deceived by the ball going away from him. With disciplined batting, Butcher and Collingwood were building a good partnership and hoisted their 50 to-gether in 161 balls. England went to Lunch at 82 / 3 off 32 overs. As Butcher reached his 50 in 122 balls with an elegant straight drive off Murali, Captain Tillakaratne had to look beyond him for strength. Vaas re-called took the second new ball in the 88th over and with clever bowling under conditions not favourable to pacies answered the call to end this 28.2 over resistance in making Butcher to snick the ball. He then made a double dent when Flintoff drove him too early away from his body to point and was caught for a golden duck on his birthday. Murali coming round brought short forward leg into play for a defending Read. England lost their anchor in Collingwood to Dharmasena in the 76th over to a fantastic low catch at Silly-point with terrific reaction by non other than captain Tillakaratne. England still had to defend 36 overs with the last three wickets in hand. Sri Lanka had to fight for another 16.2 overs to pick their next wicket, when Murali bowled well settled and dangerously then looking Batty attempting a sweep. Johnson then played on to Murali setting up the most tense of last-wicket stands as Sri Lanka tried in vain to make that last critical breakthrough. ENGLAND (2nd) 04 / 00 / 1.0 Ov. / 05 min. In a carbon copy of the first innings, England once again failed to finish the tail with Jayawardene and Muralitharan scoring at will adding 46 invaluable runs for the 10th wicket in from only 10 overs. Ashley Giless 8 / 132 is the best match figures in his cricketing career and it also took him past 50 test match wickets overseas. Curiously, Sri Lanka never showed any urgency to accelerate the scoring at any time until they were bowled out. Mahela Jayawardena for his unbeaten 86 batted for over five hours as Sri Lanka managed to inch their way to only 226 all out at tea. I personally feel, this considerably reduced the amount of time they should have exposed England batsmen to Willy Murali and in the end with weather again threatening, it could become a crucial error they have made. England will rely on opening pair Marcus Trescothick and Michael Vaughan to build firm foundations when they need to bat throughout day-five, to save the match. Their Coach Duncan Fletcher really believes the players can do that job, through building partnerships and not worrying about the pace they score the runs. SRI LANKA (2nd) 99 / 5 / 44.3 Ov. / min. The game has turned to an intriguing test match, as 13 wickets fell within the 3rd day for 257 runs in 108.1 overs, 11 of them to the spinners. Muralitharan returned 7 / 46, his 39th five-wicket haul and best figures at Galle, to help dismiss England for 235. He was the chief architect of an England collapse that saw them tumble from 142 / 2 to 155 / 6 just before tea. Sri Lanka then lost five top order batsmen but still enjoy a healthy lead of 195 runs with 5 second innings wickets remaining. Mark Butcher and Graham Thorpe, the overnight Surrey team-mates, had a clear plan to counter Murali and Jayasuriya. They did their best to resist them with a third-wicket partnership of 75 before Vaas got the vital breakthrough in getting the danger man Thorpe out lbw. Soon after they were thus departed, Murali inspired a collapse. With that, 3 more wickets tumbled before lunch for a mere 13 runs in 11.5 overs, the run rate dried up and the pressure piled onto Butcher's shoulders. From 142 / 2 it soon became 155 / 6 as rampaging Muralitharan first found the outside edge of Collingwood, then trapped Flintoff plumb in front and made Reed to give a bat/pad. Butcher managed to keep Murali at bay but fell to Jayasuriya shortly after lunch, nicking a catch to Sangakkara in cutting a ball too close to his body. Aided by 5 sixers, one by Batty and two each from Giles and Johnson, the last three wickets produced invaluable 58 runs. England trailed by 96 runs made early inroads as Jayasuriya edged a flighted Giles delivery to Trescothick at first slip. At 72/1 in the 23rd over, Sri Lanka were cruising to a big lead before Ashley Giles and Gareth Batty hit back. From the drivers seat they were then pushed back to the first row passenger seat, as 4 wickets fell for just 13 runs in 11.2 overs to make it 85 / 5. Atapattu drove Giles to Collingwood at silly point and set-off for a risky single. A slight hesitation in their running saw Sangakkara run out by yards. In the very next over, perhaps his concentration affected by that mix-up, Atapattu was outfoxed by Batty when dancing down the track he missed a straight low one to get stumped. Padding to a quicker one from Batty, Tillakaratne fell lbw and again Giles-Trescothic combination got rid of Samaraweera. England will aim to polish off the Sri Lankan tail quickly to improve their fighting chances of producing an upset win. First hours play on Day-four holds key. They then must bat positively against the other spinners, thus forcing captain Tillakaratne to over-bowl his trump card, Muralitharan. This England know from the fact that the three other Sri Lankan Spinners between them sent 54 overs but managed to get just 2 wickets giving away 123 runs. ENGLAND (1st) 97 / 02 / 37.0 Ov. / min. Muttiah Muralithran at first taunted England with the bat with a swashbuckling innings of 38 in 37 balls putting on a defiant 40 run-stand for the 10th wicket with a curiously subdued Chaminda Vaas and then single-handedly reduced England to 97 / 2. 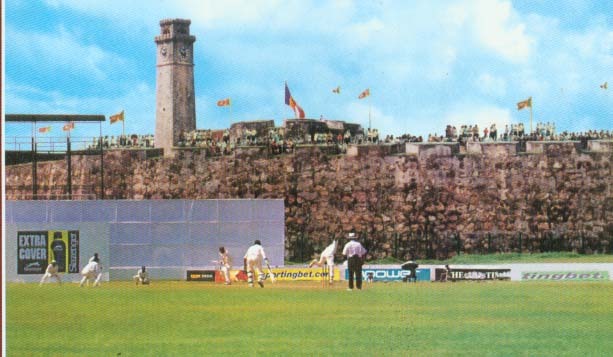 On a pitch such as this one at Galle, 40 runs can be priceless. Mark Butcher and Graham Thorpe held their nerve with great discipline in a tense end to the day as England finished 234 runs in arrears with 8 first innings wickets in hand. England started the day looking to cut deeper into Sri Lanka's middle-order after gaining honours yesterday. But with Sangakkara and Samaraweera aggressively adding 64 runs in 85 minutes of play to their overnight 138 / 4, it was Sri Lanka who grabbed the initiative early on. In the process Sangakkara raced to his 13th test 50, his third at Galle, in 152 minutes off 102 balls with 6 x 4s and 1 x 6s, before Sri Lanka lost 3 wickets for 37 runs. Johnson with the 2nd new ball in the 83rd over made the breakthrough England desperately wanted when he caught Kumar Sangakkara plumb in front on the crease. Flintoff's return after a disappointing spell with the old ball again turned the tide. With Samaraweera chasing wide outside off-stump and Chandana unluckily judged lbw to a rising ball, he took two wickets in three balls on the stroke of the lunch interval to pin Sri Lanka down to 239 / 7. After lunch two quick strikes by Gareth Batty removing Dharmasena and debut Dinusha Fernando, reduced the hosts to 291 / 9. With England looking for the kill in walked Muralitharan to tilt the balance. England bowlers failed to blow the Sri Lankan tail away, as Murali excited the crowd as he went on the attack in his own inimitable way in a typically frenzied display of tail-end cutting, driving and sweeping to good effect. His streaky 38 off 37 balls at number 11, is his highest Test score at Galle and his best against England. The final breakthrough finally came on the stroke of tea when Giles grabbed his fourth wicket to have Murali caught behind. England were cruising well until luck turned the other way. Trescothic was unlucky. The infielders rose in unison to a Murali-ball that beat Trescothick's outside edge. The batsman for some reason turned his back on umpire Harper and, for a second, appeared to be walking, voluntarily, to the dressing room. His movement was enough to persuade the umpire, and he gave him out caught for 23. It was a big bonus for Sri Lanka to get rid of Trescothick because last time he was at Galle he played Murali very well on his way to a remarkable innings of 122. When the dreaded one comes, what could you really do? The England captain attempted to pad away to another Murali special delivery very much outside off-stump but failed to account for the voracious turn and misjudged the line only to see the ball nip between his legs and clip the off stump. Andrew Flintoff believes that England must be aggressive in attack and defence against star Sri Lanka spinner Muralitharan when play resumes on day-three. England batsmen know that Murali would spin it a lot and they have got to combat that when they are the centre. One consolation for them is the fact that the big drop in pressure when Murali was rested when compared to when he was bowling, which was obvious to me even on television. In-form Mark Bucher has been a consistent performer for England for the past 3 years, averaging over 50 in 2003. Thorpe has the required temperament and application. All in all, expect a battle of patience tomorrow. England batsmen got to just keep running in and putting the ball in the right area. DAY - ONE AT GALLE. SRI LANKA (1st) 138 / 04 / 60.0 Ov. / 254 min. Ashley Giles now with a straighter and a closer run-up to the wicket, took 3 / 13 in 10 overs on a pitch already taking plenty of spin enabling England to restrict Sri Lanka to 138 / 4 / 60 overs on a rain-hit DAY - ONE. 30 minutes at the start and then 110 minutes around 2.10 pm had been lost due to rain and as such play was continued for 35 minutes beyond the scheduled close and then again is scheduled to start at 10 a.m. (4.00 a.m. GMT) on Day 2, Wednesday, 30 minutes earlier. "It's only the first day of fifteen days of Test Match Cricket", but it has been a good start by England. Sri Lanka failed to build on a solid foundation after Hashan Tillakaratne had won the toss and elected to bat, as they squandered their advantage, largely due to some uncharacteristically tentative batting. Perhaps we may have seen the effects of Sri Lanka not having played a test match for long. First period of 150 minutes play before the rain belonged to Sri Lanka as they progressed to 83 / 1 / 34.4 overs. Although the bowling was not threatening, it was economical even with Jayasuriya at one end. The openers took no chances and batted cautiously to reach 46 / 0 off 21 at Lunch. Jayasuriya then accelerated the scoring rate as the first eight overs after lunch produced 28 runs. A change in weather brought a change in luck for England as they then hit back in the post rain period to capture 3 wickets for 55 runs in 25.2 overs. Atapattu was unlucky to glove the hard-working Andrew Flintoff down the leg side. Although Gareth Batty went wickets-less, he was brought in ahead of Giles to build pressure for Giles to exploit later in the day, which he did very well. England turned the pressure magnificently be delivering 31 consecutive dot balls. The ploy to trap Tillakaratne, a batsman with such a vast of experience, was part of that "pressure inducing strategy". With men around the bat, the pressure on Captain Hashan Tillekeratne, grew minute by minute. Then trying to seize on a rare short ball from Giles, he succeeded only in edging to Chris Reid for a duck. Sri Lanka should now re-group and look at a total in excess of 300 because they can defend that as it will spin later on as they have five quality spin bowlers in this team. Hashan Tillekaratne (Captain), Sanath Jayasuriya, Marvan Atapattu, Kumar Sangakkara (W.K. ), Mahela Jayawardena, Thilan Samaraweera, Upul Chandana, Kumara Dharmasena, Chaminda Vaas, Dinusha Fernando, and Muttiah Muralitharan. Michael Vaughan (Captain), Marcus Trescothick, Andrew Flintoff, Ashley Giles, Mark Butcher, Paul Collingwood, Graham Thorpe, Chris Read (w.k. ), Gareth Batty, Richard Johnson and Matthew Hoggard. Cricket is a game, like many other things in life, much sensitive to humidity, temperature, wind and especially rain. Rain, intermittent or heavy during the playing hours or even the day before could easily become the decisive factor in the end result of a match. What is the weather forecast like for GALLE? (2). For a Second View, click here.